Wall Street liked the overall number, even if the underlying operations were nothing out of the ordinary. 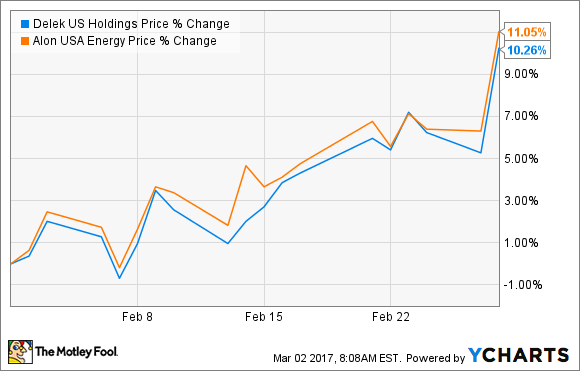 Shares of oil refiner Delek US Holdings (NYSE:DK) climbed 10% in February. The biggest reason for the double-digit gain was the company's expectation-beating fourth-quarter earnings report on Feb. 27. Also, as a result, shares of Delek's recently announced acquisition, Alon USA Energy (NYSE:ALJ), also climbed by double digits. If you look up and down Delek's most recent earnings report, nothing stands out as extraordinary. In fact, its results were pretty much in line with what we saw from every other refiner in the fourth quarter: small refining margins from the combination of rising crude prices, high levels of refined product inventory, and higher-than-average costs to comply with the U.S. Environmental Protection Agency's renewable fuels standard. Results from continuing operations resulted in a $0.44-per-share loss. The key words there were continuing operations, because Delek's GAAP reported net income came in at $0.72 per share thanks to the company selling of some U.S. retail assets in November for an after-tax gain of $80.6 million. That bottom-line numbers appear to have been enough to give investors confidence in this refining stock. As far as the Delek and Alon merger is concerned, it would seem more like a formality than anything else. After all, Delek already owns a 46% stake in Alon. Acquiring all outstanding shares brings these operations together under one roof and will allow the two to better coordinate capital spending. That will be important as the refining industry has been in the midst of a wave of consolidation. At the same time, the consolidated refiner is still a relatively small fish in a big pond, and many other companies are able to produce higher rates of return thanks to economies of scale and more complete infrastructure networks. The jury is still out as to whether the combination of these companies will make it a better operator and translate into higher returns, so investors shouldn't look at this past month's bump as a sign that things are materially better for the company. These Oil Stocks Are Getting Crushed -- Does This 1 Metric Point to a Huge Rebound? Is Calumet Specialty Products Partners, L.P. a Buy?